The phylogenetic tree shown above does not represent evolutionary history, but is merely a grouping of related families, subfamilies, genera, and species. The classification of the wood duck is based primarily on morphological traits, but geography plays a large part as well. The shared morphologies of the order Anseriformes (waterfowl) seem intrinsically related to their shared habitats, so no one form of taxonomy was used when grouping them. Tracing the Wood Duck’s phylogeny we see that it emerges from the genus Aix, which is shared only with the Mandarin Duck (Aix galericulata). The Mandarin, native of eastern Asia, has only recently made a home for itself in North America. Both species are known to nest in trees, and the drake of each species has distinct color patterns on its head, wings, and body. For an alternative look at the Wood Duck's classification we can look into mitochondrial DNA sequencing. Based on these sequences, a different chart can be developed, based on more than simply morphological traits. By using the similarities in sequences found, we can in turn justify how related on organism is to another. Below, notice how the branching becomes more complicated when reaching the genus level. Concentrating on the Wood Duck, highlighted in red, we see that many of the ducks most closely related to it share behavioral, as well as morphological similarities. Some of these including having drakes that have brightly colored feathers, and the habit of nesting in trees. 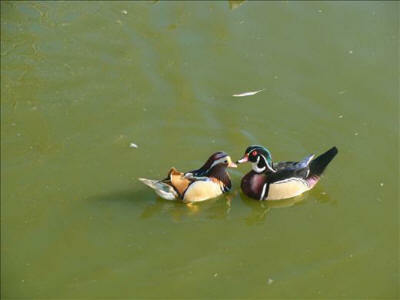 Next, learn about the Wood Duck's habitat.